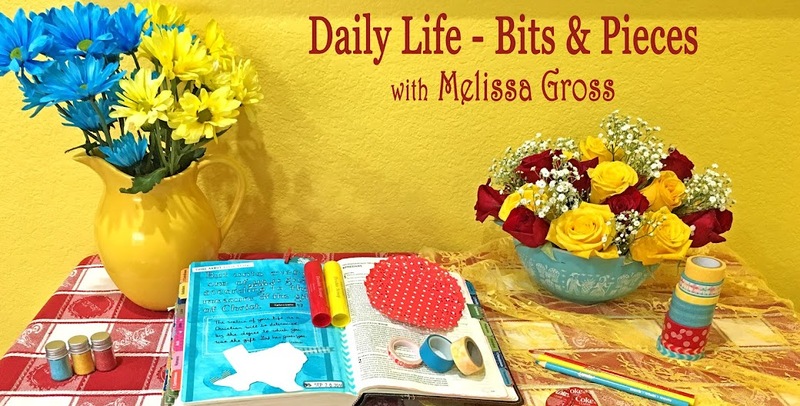 Daily Life - Bits & Pieces: So Much To Blog About! *and things I've scrapped, like my Summertime Scavenger Hunt photos. *and our "frou-frou and whimsy" Christmas decorations. I love this time of year with all the holiday gatherings and excitement as we near the celebration of the birth of our Savior on Christmas Day. 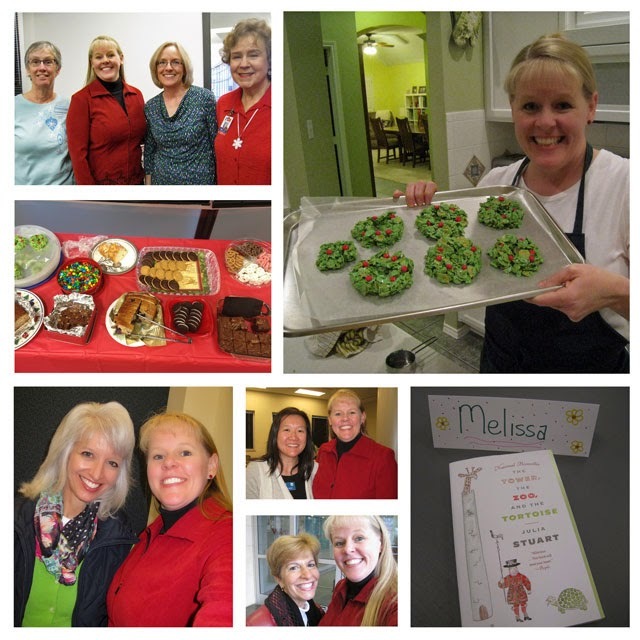 I'm not creating a December Daily project this year, but I am taking lots of photos and plan to create scrapbook pages of the various events throughout the month - like the library book club meeting and Christmas potluck lunch I enjoyed last week. I tried something new and made Christmas wreath treats this year - yummy but very messy to make! Last week, I took a quick road trip down to southeast Texas. I turned the 5 1/2 hour drive into a 10-hour drive so I could stop along the way and spend time with friends and family. Robbie made me a scrumptious breakfast so I could head out early and (almost) beat the Dallas morning rush hour traffic. 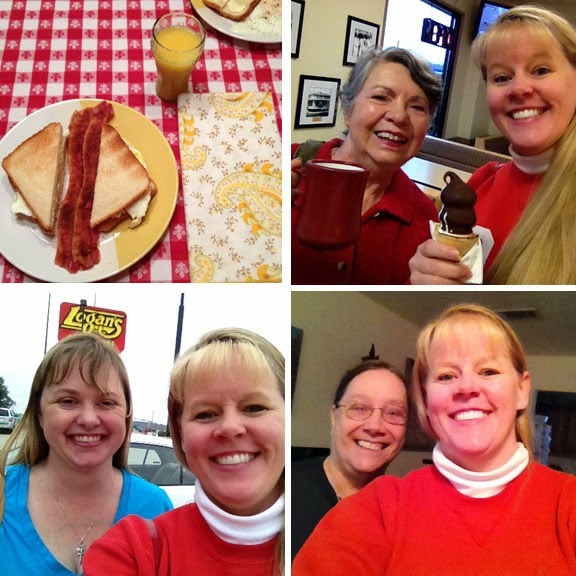 I enjoyed a visit with my sweet friend Rita, then a FUN lunch catching up with Amy, and a final stop to see Robbie's mom. As you can see, I'm striving to spend time with friends this holiday season. 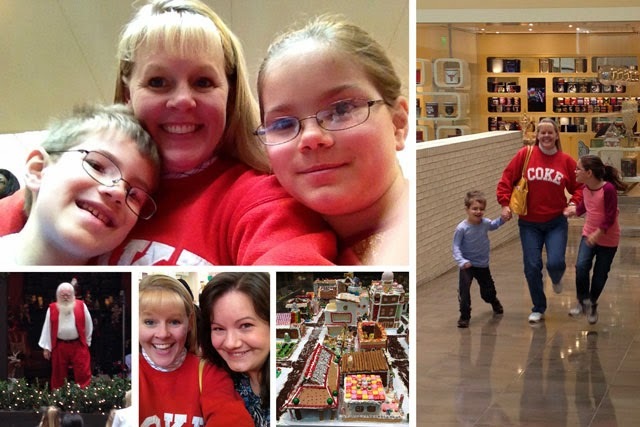 A few days ago, I met up with Thayer and her cute kids at Northpark Mall. We listened to storytime with Santa, skipped (yes, in the mall! ), and checked out the gingerbread village display before heading to Half Price Books in search of "new" books to enjoy! 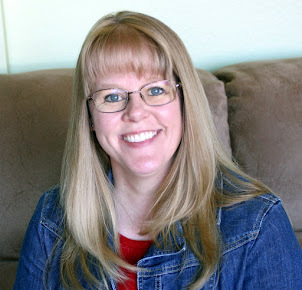 I've been quite inspired this month, too, barely even taking time to clean up between crafts (which is VERY unusual for me!). 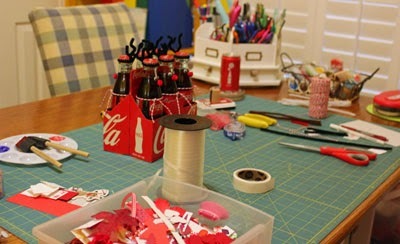 In this snapshot of my craft table, I'm working on the Coca-Cola reindeer, but there's also leftover paint from the folded Christmas trees and remnants from the treat bag tags still lying around! Whatever you're up to this holiday season, I hope you're having lots of FUN times with friends and finding time to craft along the way! I've been spending lots of time with friends this month as well, but not a photo to show for it. I have to admit when I'm out with friends, it almost never occurs to me to take a photo! Guess I'll just have to make a list for my December pages. That is a fun group of photos! Two posts a day, you're putting the rest of us to shame. It looks like you are enjoying the festivities quite a lot this year.